Super Mario Klemp-Won-Do: Muskeln sind nicht alles! (English translation: Super Mario Plumb-Won-Do: Muscles are not everything!) is the name of the comic published in the 5/1992 issue of the German Club Nintendo magazine. It was the first comic in this magazine to be four pages long, after a series of 2-page comics. The story starts with Mario looking at a shield outside, which reads: "Street Fighter II - Who will become grand master?" He seems to be interested, and imagines being celebrated for winning this contest. Realizing that he needs to prepare, he starts a hard triathlon training. When seeing him run, Luigi makes fun of his brother, asking whether his building loan contract is expiring. Finally, after several weeks of practice (but still without any changes in appearance), Mario enters the contest room. Here, he meets E. Honda, Dhalsim, Ken, Chun-Li, and Blanka from Street Fighter II, all about twice as tall as Mario; the fighters make fun of him, asking whether he is delivering pizza. Frightened, Mario tries to escape from the room; however, he runs directly into Donkey Kong (wearing a suit and sunglasses), who tells him to stay due to a "score still to settle" between the two of them. 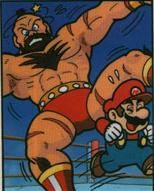 Mario has no chance to escape, so the first fight between Zangief and Mario begins. The fighters are introduced by the referee (who, telling from his appearance, may be Luigi) as "a man like a bison" and "an unimportant lightweight from Brooklyn" respectively. Mario, trying to escape from him, starts running around him. This confuses Zangief, making him fall down dizzily. The referee declares the victory of Mario, who is very surprised. In his second fight, Mario's opponent is Chun-Li, who he immediately falls in love with. Expecting a "victory kiss", he is surprised when she starts to kick him. This gives Mario the idea to tickle her feet with a feather. Unable to fight, Chun-Li loses this match. The third fight has Blanka as Mario's opponent. Mario gets supported by Toad, who brings him some Bananas. He cleverly uses them by throwing them in front of Blanka, who slips and falls right out of the boxing ring. In his fourth and last match, Mario fights against Dhalsim, who uses his Yoga Fire abilities. Mario is able to avoid his fireballs. After bringing a bucket of water, the plumber pours it out on his opponent, making him unable to use his fire skills. Dhalsim tries to kick Mario afterwards, but Mario grabs his leg and ties his body up into a knot, winning him the contest and the trophy. Ryu, the main character of Street Fighter, ironically did not appear in this comic; however, he would later appear alongside Mario characters in the film Wreck-It Ralph and later in Super Smash Bros. for Nintendo 3DS / Wii U. None of the Street Fighter characters in this comic would appear in the latter, apart from Ken as a collectible trophy. Ken would later become a fighter in Super Smash Bros. Ultimate and the other Street Fighter characters that appear in this comic appear as spirits. This page was last edited on January 2, 2019, at 14:53.